Oil leaves your skin and hair feeling restored, nourished and glowing. Plus, with so many new de-greased, whisper-thin formulas on the market, there's one for every part of your beauty routine! Read on for the five best oils that are packed with plumping vitamins, not to mention nothing short of transformative. Want to firm up your skin? Look no further than orange or mandarin essential oil! Both of these fantastic citrusy-smelling oils will tone up skin that’s losing its “snap”. They’re especially good for slackness after pregnancy or weight loss. 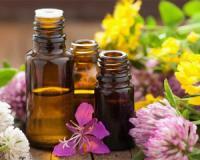 To wake up your whole face, all you need is a few drops of rosemary or geranium essential oil. They help reduce visible puffy skin and water retention, making them a lifesaver after a sleepless night or long-haul flight. Is your thinning hair or receding hairline making you feel old, self-conscious and down-right embarrassed? Fade fine lines, redness and scarring to reveal a fresh, glowing complexion with a concoction of camellia, rosehip and buriti nut essential oils. They work together to calm your skin and impart a lovely bloom! The secret to treating cellulite is maximising your blood circulation. Birch oil stimulates circulation and improves skin tone at the same time. If you use it religiously, it will drastically reduce cellulite on all areas of your body. Dry or dull locks? Simply slather on some coconut oil for a pre-shampoo deep-conditioning treat, or use sparingly for everyday taming. It’s also excellent for treating a dry or flaky scalp, or nourishing split ends.